Junior forward Beto Velasquez wrestles for position against a Black Knights player. 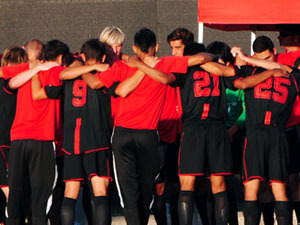 The Matadors (3-3-0) won convincingly as they shut out visiting Army (2-4-0) 5-0 in their home opener at Matador Field. The Matadors dominated from beginning to end, pushing the pace and displaying an aggressive game plan to put pressure on the Black Knights. CSUN was focused on both offense and defense throughout the game, as it shot the ball 24 times and held the opposition to just eight attempts. The Matadors began their dominance in the first half scoring three goals. Junior forward Brian Behrad, who was assisted by junior midfielder Carlos Gonzalez, put the ball in the back of the net in the 38th minute and scored the first goal. The next goal was when senior defender Yuval Barak assisted junior forward Beto Velasquez in the 33rd minute. Freshman midfielder David Turcios assisted sophomore forward Sagi Lev-Ari for the team’s third and final goal five minutes before the first period ended. The Matadors maintained the same intensity in the second half, scoring two more goals. Lev-Ari scored another goal, along with senior defender Jose Luis Garcia, to secure the win. “We didn’t know what our identity was and we learned what it takes to win at this level,” said CSUN head coach Terry Davila about his team’s character. “We put out a lot of energy and we helped each other,” junior midfielder Chris Smith Smith said of his team’s performance. 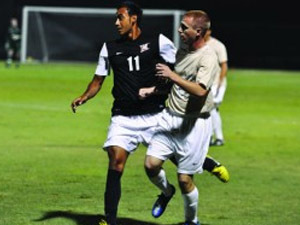 Once the Matadors scored their first goal, the Black Knights had a hard time responding to the pressure, Smith said. Freshman goalkeeper Luis Ayala-Padilla made two saves his first start this season. He started due to Michael Abalos sitting out because of an undisclosed injury. Northridge will play its next game at home against the Temple Owls on Sunday.